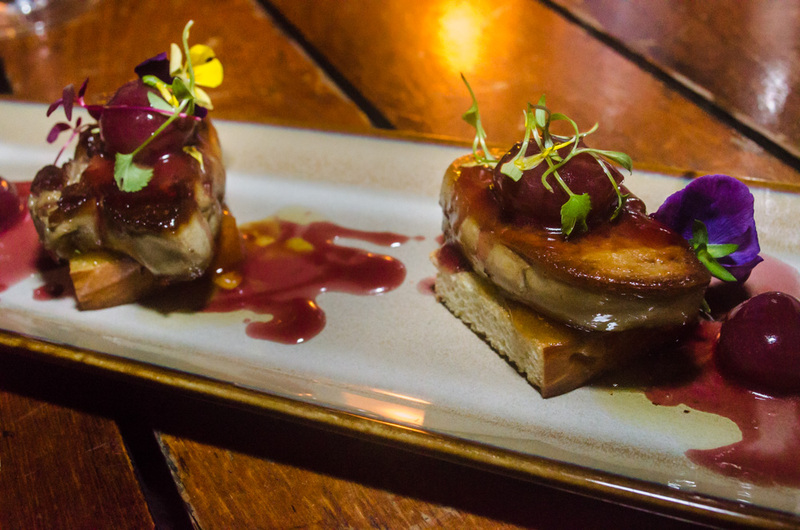 Singapore is truly a city for foodies. Last week I introduced affordable eats in the Lion City. These options are great for a quick lunch in between sightseeing, but what if you have something to celebrate? A birthday? An anniversary, perhaps? Or, maybe you’re like me and just like luxury. Whatever the case, you will have no shortage of choices in Singapore. 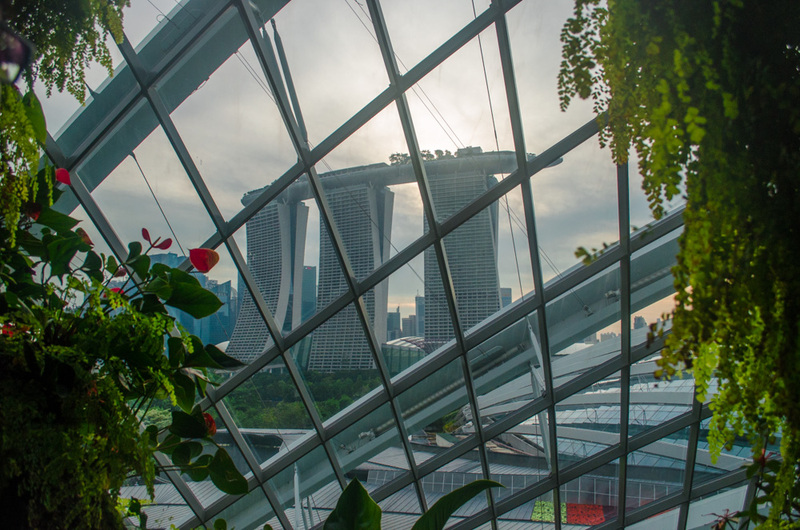 During our trip to the tiny island nation, we enjoyed an indulgent night on top of the world, a dinner at the Marina Bay Sands. While the name may or may not sound familiar, you’ve definitely seen pictures of this place while scrolling through your instagram feed—a resort comprised of three towers, standing over 50 stories tall, supporting a 340-meter-long boat with an infinity pool called the SkyPark. Touted as an ‘integrated resort’, the 2010 build is home to a shopping center, casino, theaters and exhibition space, a 5-star hotel, restaurants, and more. 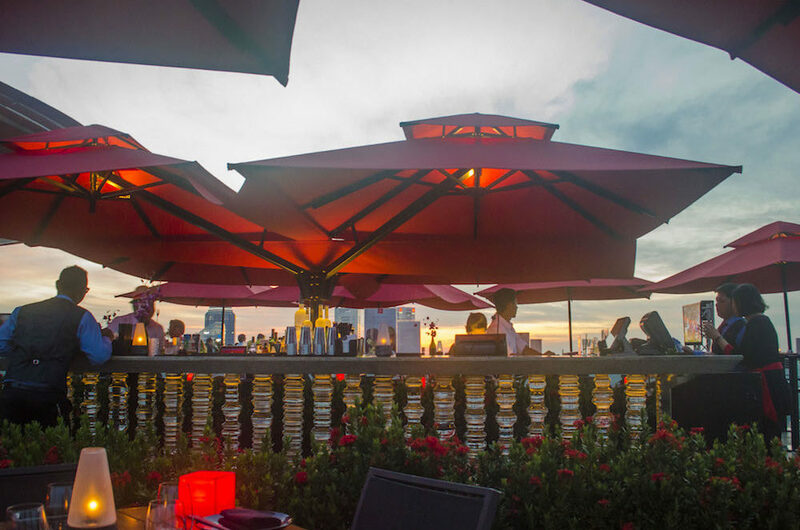 Located at MBS’s SkyPark is CÉ LA VI, a posh rooftop bar and dining venue with arguably some of the best views in Singapore. With four locations worldwide, CÉ LA VI is renowned for its exclusive nightlife and top-notch entertainment. 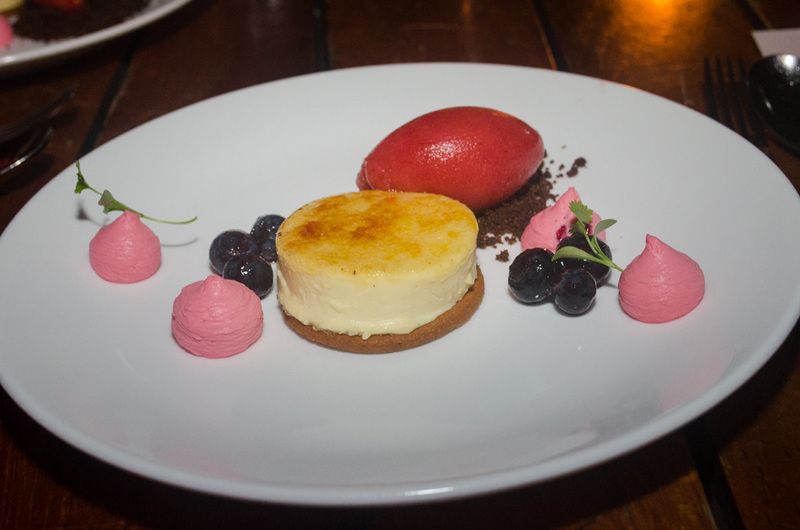 CÉ LA VI Singapore features an indoor restaurant, plus a SkyBar and Club Lounge outside. A state-of-the-art sound system at the SkyBar welcomes talented resident and guest DJs, who set the mood from 18:00. We walked to MBS after an afternoon at the Gardens by the Bay. Upon arrival, we gave our name to the reservations person who then stamped our hands with black light ink and ushered us to the direct access elevator. We got to the SkyPark a bit early, so we were free to walk around a bit and enjoy the Singapore skyline at sunset. While the deck below was crowded, the top deck was not. Only accessible to those dining at CÉ LA VI and hotel guests enjoying the infinity pool (only hotel guests have access to the pool area), the top deck has multiple security measures to ensure exclusivity for guests. After enjoying the sights for maybe 10-15 minutes, we returned to CÉ LA VI. The staff checked our access stamps and then escorted us to a table for two overlooking the bay and racetrack. Our trip to Singapore was right during the Formula 1 Grand Prix, which has nighttime races, so we essentially had the perfect table to enjoy the party atmosphere and the Prix. The restaurant serves Asian fusion and has an a la carte menu as well as set menus. We went with a special set menu available during the Grand Prix. And because CÉ LA VI is known for their mixology, we opted out of the wine pairing and ordered a few cocktails instead. 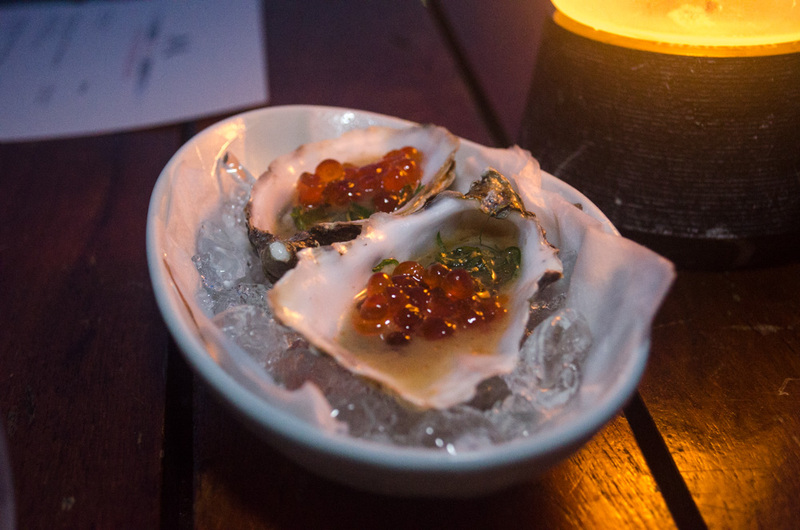 Altogether, food and drink were bursting with unexpected combinations and pleasant surprises. Dinner at the Marina Bay Sands CÉ LA VI requires reservations in advance and a minimum spend of SGD80 per person. The reservation is for a two-hour time slot. Entrance to the SkyBar is on a first-come, first-serve basis. The dress code is smart-casual for the restaurant and SkyBar and casual chic for the Club Lounge. Children under the age of 12 are not permitted in the outside area of the restaurant after 7pm, and only guests 18 and above are allowed at the Club Lounge after 10pm. Entrance is through Sands Skypark Hotel Lobby, Tower 3. This is on my absolute bucket list to visit! 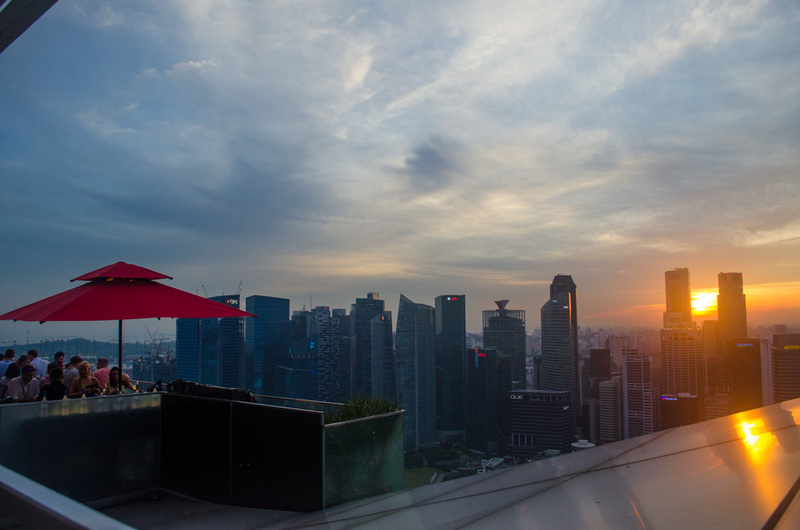 Your photos look AMAZING and sunset definitely captures the true beauty of Singapore. Thank you so much! Singapore is definitely worth visiting sometime! Such a lovely post and pictures. Must say Singapore is a foodie’s paradise. Wow looks like a real luxury, a bit out of my budget I think but must have been stunning seeing the views. It’s an amazing hotel I watched a TV programme about it the other day and the behind the scenes is insane!! !